We walked in to look at a few cars and Chris Davis was very helpful and right away we felt comfortable with him. Joking around, introduced himself to our two young kids, we would highly recommend him to any of our friends and family! Our whole process from walking in and test driving to walking out was quick and easy! I thought that the world hyundai was a wonderful place to perchase a car. 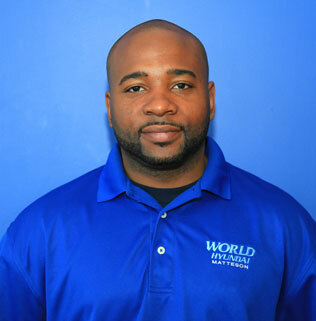 David and other employees were friendly and work with you on the payments to get you the car you want or need. As a first time buyer I would come back again and recommend this to anyone. Thank you for being visiting World Hyundai, we are happy to have such terrific customers like yourself! We hope to see you again, soon! Bradley Bourbonnais Hyundai client is happy at World Hyundai Matteson. I apreciated Angie V hard work in putting me in a car I wanted 08 charger.I ran into a deer and totaled my car out, I been trying to get financed at other dealers ,but kept getting turned down untill I came to World Hyundai. They made it happen for me! i am very happy with the service and the deal i got today.